Nestled among tropical gardens, the Grand Palladium Colonial Resort & Spa the grounds are surrounded by an abundance of local flora and fauna, creating a peaceful, relaxing environment. An array of modern amenities complement the resort's stunning Spanish colonial-style architecture and décor. Stroll to the beach or lounge at one of the six freshwater pools. Enjoy varied dining options at nine themed restaurants or enjoy a cocktail at one of 21 bars. End your day in bliss at the Zentropia Spa and Wellness center. 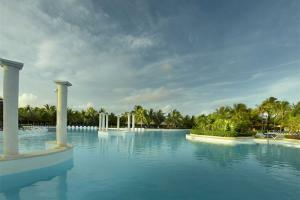 The resort is 24 miles from Cozumel Airport, and 50 miles from Cancun Airport.